Life is better with chocolate! Especially during the winter months, when we can indulge in one of the most iconic beverages: hot chocolate. But there are times during the remaining three seasons, when we crave this decadent drink, but it's too warm outside to warrant making it. But what to do then? Well, we've come up with a recipe just for you: Frozen hot chocolate! 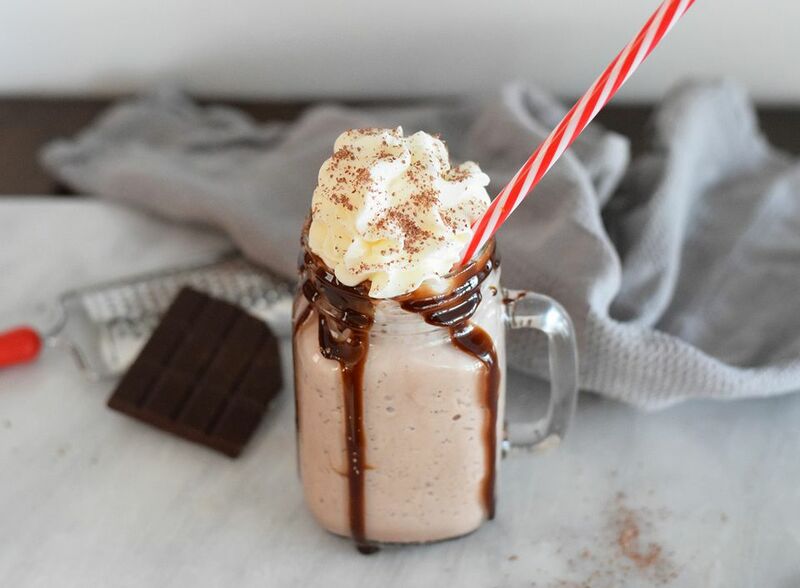 Simply add hot chocolate packets to ice and milk and you've got a delicious frozen hot chocolate treat! It was made famous by Serendipity 3 in New York City, but you don't have to leave your kitchen or wait in a ridiculously long line to enjoy all of its deliciousness. Instead, all you need is a blender to make this happen. It is refreshing in the summer, but can be enjoyed any time of the year. Create the chocolate shavings ahead of time. Use whatever kind of chocolate you wish. It's easiest to create the shavings from a bar of chocolate. Use a grater or special chocolate shaver to create the shavings. Add the ice, whole milk, chocolate syrup, and hot chocolate packets to a blender. Use a blender that can easily crush ice or make smoothies. Crush until smooth. Drizzle chocolate syrup around the rim of four glasses so that the syrup will drip down the sides. Pour the frozen hot chocolate into each glass. Top each glass with a generous amount of whipped cream. Sprinkle the chocolate shavings over the top of the whipped cream and serve with a straw immediately! You can use any type or variety of hot chocolate packets, but the sugar content may vary packet to packet, so you may need to add a little more milk and ice if the sweetness is too much for you. Try out different flavors, like peppermint hot chocolate, and garnish with crushed peppermint sticks. Or you can try a Mexican hot chocolate variety by adding cinnamon. If you are looking to reduce the sugar, look for sugar-free hot chocolate packets or check your health food store for lower sugar alternatives. If you are over 21 and want to add a little party to this decadent treat, try a boozy adult version by substituting half a cup of milk for half a cup of Bailey's Irish Cream! You can also add things like Kahlua or Frangelico to put some spirit into your frozen hot cocoa. You can use dairy-free milk for this recipe, like almond milk or coconut milk, however the hot chocolate packets typically contain dried cow's milk, so this recipe still won't be vegan. If you are looking for a vegan option, we recommend trying to find vegan hot chocolate packets and pairing it with a diary-free milk.